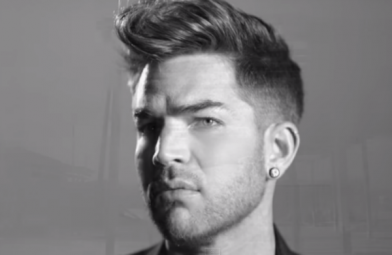 Pop superstar Adam Lambert has premiered the music video for his exciting new single ‘Ghost Town’, which will be released in the UK on June 7th. The video was directed by legendary video and film director Hype Williams, the visionary who has helmed some of the world’s most iconic, award-winning videos including Beyonce’s “Drunk In Love”, Kanye West’s “Gold Digger”, TLC’s “No Scrubs”, Aaliyah’s “Rock The Boat”, Coldplay’s “Viva La Vida” and Missy Elliott’s “The Rain (Supa Dupa Fly)”. After weeks of global excitement, Adam revealed ‘Ghost Town’ last week, taken from his forthcoming studio album which has been executive-produced by Max Martin and Shellback and features tracks with Brian May and Tove Lo. Within minutes of it’s premiere, the track title was trending worldwide across social media, and in just five days, the lyric video for ‘Ghost Town’ was streamed over a million times! Further to this, the track is now the #1 most added song on US radio this week. With a whistle hook set to lodge itself in heads around the world, the massive track is the first taste of what to expect from The Original High, which will be released on June 15th. Yahoo declared ‘Ghost Town’ a “massive summer anthem”, while Digital Spy called the track “glorious”. A “triumphant return” according to Official Charts, as Sugarscape added that it “should be number 1 for approximately 9 weeks”. Yahoo US said ‘I’ve heard the Future of Pop and it’s Ghost Town’. Both the single and album are now available to pre-order on iTunes. In its first 24 hours available for pre-order, ‘The Original High’ leaped in to the iTunes album Top 10, the highest album pre-order on the chart. Adam’s 2015 has already got off to a stunning start as he saw in the New Year performing live with Queen on BBC One. With 13.5 million watching, ‘Adam Lambert’ became the most searched on Google UK for 4 days. Extraordinary reviews for Queen + Adam Lambert followed as their world tour reached the UK, including 3 sold out shows at London’s O2 Arena/Wembley Arena. Adam launched ‘Ghost Town’ by covering publications including Notion, Hunger and Attitude. And that’s just the beginning! Watch this space….